MojoHost Review 2019: Is MojoHost a Good Hosting? MojoHost is an American web hosting company that’s been in business for over 15 years. They boast a modern infrastructure and proactive, round-the-clock support that make it possible for them to deliver quality web hosting solutions to businesses of all sizes. MojoHost is headquartered in the United States but owns data centers in the U.S. and the Netherlands. Most of their customer base is American, but their global network and IP space allows them to serve foreign users from countries such as Mexico, Brazil, Ukraine, and the United Kingdom. Founded in 1999, they’ve now served thousands of clients and billions of surfers. They’re privately held, self-funded, and have been profitable for almost two decades. Presently, their website is only available in English, though they also have a European extension of their service that’s available in 26 different languages. MojoHost has invested heavily in their hosting infrastructure. They proudly proclaim that they own and operate their own global network and IP space, ASN 27589. This makes it possible for the company to peer as well as exchange traffic with many networks at different internet exchanges. 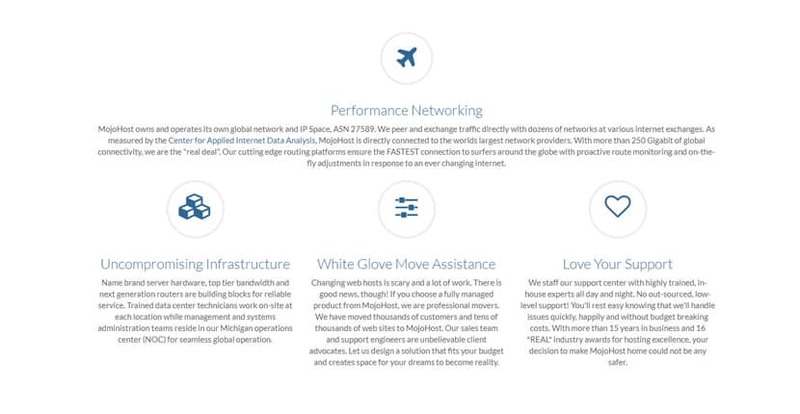 According to the Center for Applied Internet Data Analysis, MojoHost has direct connections to the largest network providers in the world. While some customers use MojoHost for their unmanaged infrastructure, the majority of their customers entrust all their IT operations to the vendor. Their existing customers regularly tout MojoHost’s fully managed services as top-notch, empowering even non-technically-savvy users to maintain websites on a VPS without much hassle. One downside of the vendor is that while they do offer HTTPS traffic with their CDNs, they don’t resell premium SSL certificates. If you need one for your website, you’ll have to find it elsewhere. Compared to other premium hosting providers, MojoHost’s VPS plans are competitively priced. In fact, I’d go so far as to say that considering the resources you get with the SSD VPS plans, they offer some of the best value in the market. Where you’ll have to pay up is for the add-ons and the server management services, however: the fully managed plans can increase your base price by up to 1300%. They don’t have a money back guarantee, sadly, so there’s no way to test out their service before you commit. Furthermore, their migration service comes as part of their fully managed package, so if you need help moving your website over you’ll have to pay a hefty monthly fee. Support is by far the best thing about MojoHost. They’re very proactive about reaching out to customers, and will work to resolve any issues before you notice a problem. If, say, they’re patching your server and fixing up any vulnerabilities, they’ll contact you to make sure that the patching takes place at a timing at which it isn’t as critical for your website to be online. Customers can contact the vendor’s support via email, a toll-free telephone number, their ticketing system, and the contact form on their website. However, the company has no live chat and the knowledge base has very little information. That said, users with limited technical skills love this vendor because they don’t inundate you with a lot of tech speak, and they take you through the process one step at a time. Even when you need a simple WordPress website transferred to their servers, their support team can help you with that. In fact, the support team is often willing to have conversations with your developers to resolve any hosting issues that may arise. Many customers have reported that MojoHost’s support team goes above and beyond to help them resolve whatever type of challenge they face. MojoHost has the experience and expertise to handle business websites of any size. The vendor is best known for their managed services and incredible beginner-friendliness to those new to VPS and dedicated server solutions. Wondering how MojoHost stacks up against other Web Hosting companies? Enter any other Web Hosting company and we will give you a side-by-side comparison.